This is my second attempt at Sepia Saturday which is a fabulous thing I've just discovered! I have already written a post on an ancestral house which had three generations of my family living in it. Click here to read more about Willowgrove and its history. 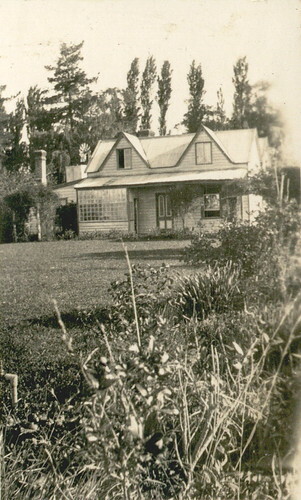 It was a beautiful old colonial cottage, built sometime around 1870-1871, probably built by builders for my ancestor Karl Philipp Meng who bought the land from the Crown in the district of Ohoka, Canterbury, New Zealand. This house had many deaths in it - seven in total that we know about, possibly more. There was the death of twin baby girls aged three and four months, named Lina and Amelia Meng who failed to thrive as their mother had no breast milk and they wouldn't drink from a bottle. Then there was the death of their mother Elise Katharina Meng in 1879 along with her stillborn baby. She bled to death and her husband Karl came back and found her dead. We don't know any exact details of what happened, only that her husband wasn't there when she died and that "postpartum hemorrhage, ignorant neglect" was written on her death certificate. Very accusing words, but who was to blame was never mentioned! Karl was left without a wife to care for the four girls he still had. Then his daughter Elise Mary died aged 12 of pneumonia in the same house - four deaths now in this house. Karl remarried, moved out and leased the property to other farmers. When he passed away in 1885, the house and farm passed to his three daughters. One of the daughters, Mary Lord, nee Meng ended up owning the property with her husband Edwin, eventually paying out her sisters. While the Lord family lived in the house they lost two family members. Catherine Lord who died at aged 1 month old as she wouldn't feed and their son Carl Edwin Lord, or Carly for short, died aged 7 years old in 1910 and so very much loved by the family. He died of diptheria and left the family in a state of mourning. So Willowgrove, which probably had a lot of good memories, also had a lot of ghosts. I visited the property in February 1997 with my Mum, it turns out we made the visit only two months before it was demolished. At the time we had no idea of this impending demolition and were sitting at the dining table that day and started talking about the house. Some pine trees had been cut down and the house was now visible in the distance from the road and we kept thinking about it. We decided if we didn't visit then and there, then we would never do it and might miss the chance. We drove the 9 kms to get there and knocked on the door of the new house which was built about a hundred metres away from the original farmhouse. 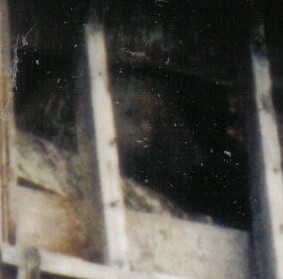 The people in the house were tenants and said we were welcome to look around the old farmhouse but that the floorboards upstairs were rotten and not to go up there. We took many photos inside and outside the house and I got them printed and filed them away for a few years. 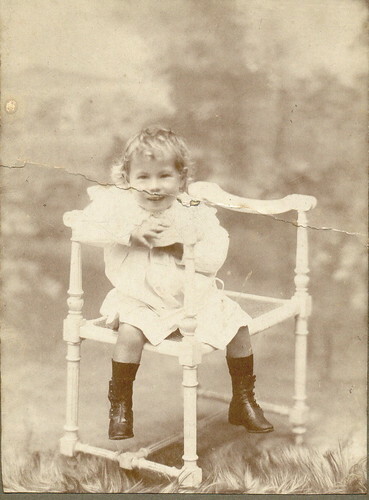 When I went to do a family history book over ten years later, I decided to scan the photos and put them into my book. After scanning them and blowing them up, I saw two strange faces looking at me from the picture. One looks like a face in the top window and the other a baby's head. They are probably just cobwebs or shadows but everyone in our family agrees that they look ghostly. I like to think that ghosts do exist. What do you think? 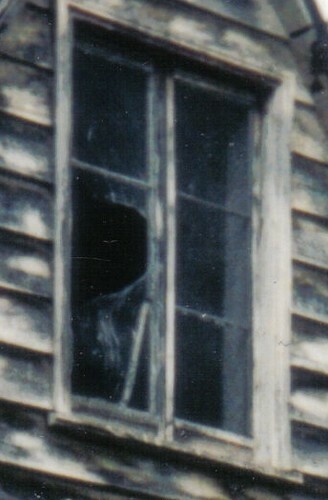 A face at the window? A house with a sad history over the years, It was a shame that it reached such a state that it had to be demolished, I can definitely see a face in the first of the two window pictures. Fascinating history of a house. It was a lovely home too at one time. And yeah, I see that face too. Coincidentally, I'm reading this on Halloween - not sure you celebrate that, but the timing of this blog post is perfect here in the USA. What a sad story, , beautifully told, and yes, I can see what you mean about the "images" at the windows. they do look kind of ghostly. I wrote the post Wendy and then realised it was Halloween the next day, so it was coincidental. Some people celebrate it here, but it think it is much bigger in America. Thanks for all your nice comments. I'm not used to anyone commenting on my blog, but Sepia Saturday is such a welcoming place. Thanks guys! It looks like it was a beautiful home but such sorrow it held. Perhaps I feel saddest for Elise. She was probably home alone with no means to contact anyone for help. How good that you were able to get photographs before the house was torn down. Yes I guessed that Elise was alone and couldn't get help. A terrible end to her life. When one of the twins died she had the same situation. The baby was very sick but she couldn't go for a doctor as her husband was in town a long way away buying a double perambulator for the twins. By the time he got back, one of the twins was dead and the pram was redundant. I can never get over how bad this family had it! Their first child drowned in an animal waterhole aged 2 and Elise just couldn't find where she had gone. She eventually found her face down in the waterhole. That is so sad Bel. Yes that first photo is a bit spooky. But how wonderful to have it. I see the face in the first photo. What a tragic history. So very sad. To lose so many children in a variety of horrible ways. I see those faces, such an extra ordinary photo! Wow that could have been the house that thrived through deaths. Very interesting a great tale for Halloween!. Such a lovely place in the first photo. And then such sadness as it gives in to the weight of its memories. Deaths in homes was so common. We are now often removed from it with deaths in hospitals or care homes. Thanks Bel. I had a look at your earlier blog about the house and the combination is a lovely record of your family and their home. It does appear like a head for sure. Great stories to go with a treasure of photos. So happy you joined us at Sepia Saturday, it is a lot of fun, creating our own posts and viewing and learning from all the other posts as well. 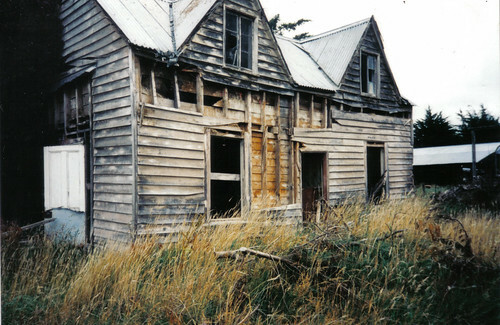 Oh dear, an unhappy house in so many ways, but a fascinating history. You've totally freaked me out here. How very sad - all of it. There must have been many sad stories in those days when illness and disease were hard to cure. I won't forget that face in the window easily.